DOLBY DIGITAL is premium audio engineered technology that delivers full, rich and clear outputs across all wave lengths and volumes. 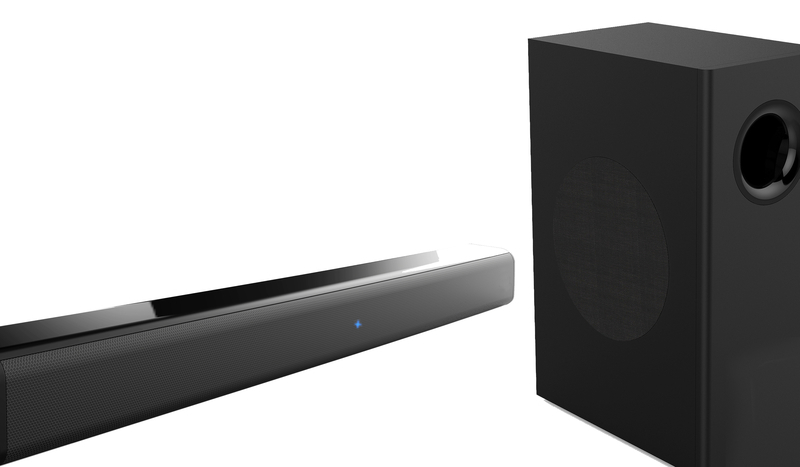 Brilliant design where the soundbar has a built in air vent that allows unrestricted expansion of sound waves to produce crisper sound zero distortion. These extra ports allow the bass to swell to higher levels, where sound does not get distorted and the Bass keeps booming! AUX, USB, Bluetooth, Optical and HDMI (ARC) connectivity is available in a matter of seconds. Soft touch buttons that give you micro control over the output, so you get the perfect volume.This setup allows you to balance your audio perfectly. The USB port is also conveniently located for easy access and use. A combination designed to give you crystal clear sound at very high volumes. The tech here is perfectly balanced to enrich music across a wide frequency. The Bass pours out of these vents and you feel it go right through you. Not only do you get information about what’s playing it also looks fantastic. Smooth contours and rounded edges give this beauty a timeless look. Additional to the beauty is a bit of tech that makes the design contribute to the output. The fully functional remote control lets you, at the press of a button, to get the EQ mode. This allows you to fine tune every frequency and wave length. Total control over how you like your music. Add more bass or take the high frequencies even higher. You now have control to fine tune your audio preference.